In this bio-recipe we construct a class for discrete Bayesian networks. Bayesian networks are really a subset of the category of graphical models. Graphical models combine probability theory and graph theory. These models are useful because they provide an intuitive graphical representation of a joint probability distribution over a large number of random variables. Any joint probability distribution can be visualized by a graph G = (V, E) consisting of a set of vertices (V) and a set of Edges (E). The vertices or nodes in the graph symbolize the random variables. Two nodes in the graph are joined by an edge whenever the two random variables depend on each other in a stochastic sense. Consequently, the lack of an edge between two nodes represents conditional independence between the two nodes. A more comprehensive description of Bayesian networks and graphical models is given by Kevin Murphy. As already mentioned Bayesian networks (also known as Belief Networks) are a subset of the larger class of graphical models, namely the subset that uses directed acyclic graphs (DAG) to represent joint probability distributions. That means the independence assumptions take the directionality of arcs into account. To define a Bayesian network, one has to specify the structure and the parameters. To illustrate the main concepts we consider the same example as Kevin Murphy did in his description. The following figure shows the graph structure and the assumed input parameters. The example used here is well known under the name 'Sprinkler example'. The network consists of 4 nodes and it models possible causes of grass being wet (WetGrass). The grass can either be wet because of rain (Rain) or because the sprinkler was on (Sprinkler). Clouds in the sky (Cloudy) influence both Sprinker and Rain. We assign the total number of nodes to the variable N and encode the nodes with integers from 1 to 4. The nodes must always be sorted in topological order, i.e., ancestor nodes must precede the descendants. In addition to specifying the graph structure, we must also specify the size of each node. The size of a node is defined as the number of possible states it can take. In our example, we assume all nodes to be binary. At this point we also make the rather random assignment of 'false' corresponding to 1 and 'true' corresponding to 2.
where AdjMat contains the adjacency matrix, NodeSize the vector with the sizes of the nodes, NodeName the vector of the names of the node, ObsNode the vector with indices of the observed nodes, parents a list of which each element consists of all parents for the respective node, and CPD the conditional probability distributions. After having defined the BayesNet class, we can create an instance of this class by just calling the class name with the appropriate arguments. The above specified node names can then be used as an argument to BayesNet. When working with Bayesian networks, we often need to know the parent nodes of a given node. Hence, it is convenient to have a method that operates on the BayesNet object and returns for each node a list with the parent nodes. The result of the method GetParents is stored in the parents field of the BayesNet object. 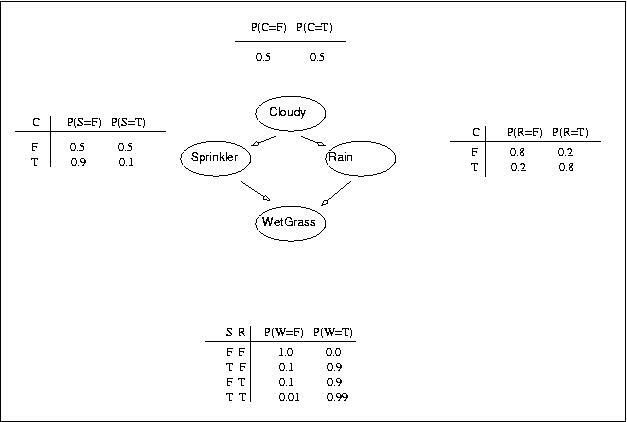 The parameters of a graphical model are represented by the conditional probabilities (CPD) of each node given its parents. The simplest form of CPD is a table, which is suitable when all the nodes are discrete-valued. Tabular CPDs, also called conditional probability tables (CPT), are stored as multidimensional arrays. Note that the CPT have to be specified such that the index of the node toggles fastest and the index of the first parents toggles slowest. The array 'ConProDistr' contains on each row the conditional probabilities of each node given its parent nodes. For nodes that do not have any parents the row in 'ConProDistr' contains just the prior probabilities. The CPTs that we have specified above, can easily be visualized by converting them into Darwin tables. In order to prepare this conversion, we first write two procedures that will be needed for the conversion. The first procedure computes for a given node the total number of possible state combinations for the node and all its parent nodes. The second procedure generates one state combination for a node and its parent nodes at the time. The above procedure extracts the parents of the node we are interested in. If this node has no parents the total number of state combinations is just its node size. Otherwise the product over the node sizes of the parent nodes and its own node size is computed and returned. So far we have just computed how many possible state combinations we can have looking at a given node and its parents. This number determines the number of rows that the Darwin table to represent the CPT for a given node has. Now we have to generate all possible combinations. The procedure 'CreateStatComb' aims at generating a certain combination of states of a given node and its parent nodes. When called in a loop over all integers between 1 and the total number of state combinations, the result will be all possible state combinations of the node and its parents. Please note that the ordering of parents has to be consistent with the ordering in the BayesNet class. The node has to be specified last. The generated states will now be used in the conversion procedure which follows next. #  using the procedure GetTotalNrStateComb. The result of the conversion can now be shown by first calling the conversion procedure, and then performing a loop over all nodes and printing the tables. So far, we have specified the parameters (CPD). Now we have to enter them into the BayesNet object. In the class declaration of BayesNet, we have reserved a field called 'CPD' which is now used to store the parameters belonging to the Bayesian network. The parameters are entered into the BayesNet using the procedure 'EnterCPD'. This procedure enters the parameters for just one node at the time. To enter all parameters of the network, the procedure has to be called for all nodes subsequently. This allows us to update parameters later using this same procedure. #  in which they are specified is correct, if not throw an error. # groups of elements of nsn in CPT have to sum up to 1. Now we are done with creating a BayesNet object. We have specified the structure of the network and entered the parameters of the network. If we want to check all our entries, we can just enter the name of our BayesNet object at the Darwin prompt. In order to produce a nicely structured view of the BayesNet object we define a print method. Calling the print with the BayesNet object as an argument produces a nice output.